← A snapshot from the weather war zone. 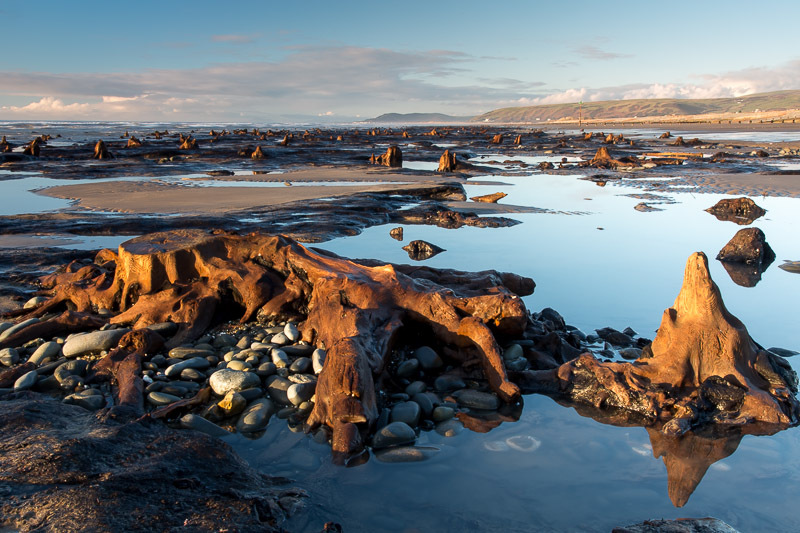 The recent storms along the west coast of Wales have exposed a large expanse of peat between Borth and Ynyslas, dotted with numerous tree stumps. Depending on the distribution of the sand, this submerged forest is visible there to some extent in most winters, but this year it is something else. Judging by tide lines on groynes, sand to a depth of two feet has been shifted completely from a two-mile long section of beach. It is difficult to conceive of the sheer volume of material involved. Or where it has gone! The trees have been dated to between 3500 to 5500 years before present and consist of pine, alder, oak and birch. Their root systems tend to extend horizontally – as can easily be seen in situ – and this is typical of fen woodlands with a high water table. It is known that in prehistoric times sea levels rose to inundate this coastal woodland. The submerged forest has been reasonably well documented, so I’ll leave interested parties to investigate further for themselves (for example here ). What seems to be lacking is any mention of human activities associated with it. While most stumps look broken and worn as if naturally created, it can clearly be seen in the top photograph that a tree has been felled at stump level using a saw. Probably not that long ago then…… Elsewhere there are quite clear signs of peat cutting, presumably for fuel (see lower picture). How long ago this was done I would love to know. Photographically speaking I found the submerged forest rather a challenge. I’m getting used to a new L-bracket/tripod head combination at the moment, so what was until recently second nature no longer is. I knew what I wanted – water flowing amongst tree stumps at sunset – but my technique tends to get a bit rusty over the winter. (see this post). I would need exposures of five or ten seconds and only the use of a heavy neutral density filter would achieve this. With just one exception all the exposures on my first vsit suffered badly from camera shake. Time for a rethink! I’ve never bothered with a filter holder but using mutiple filters really does call for one. I was, on occasion, stacking a polariser and a screw-in 10-stop ND, topped off with a 2-stop ND grad held against the rim of a telephoto zoom lens! Not ideal at all. But given that I don’t actually possess a filter holder, on my second and third visits I tried to eliminate all other sources of wobble. Short zoom only, two-second timer, then ten second timer. More wobble. Then I noticed that the lens IS was switched on. Could that be the source of the problem? Hopefully my next visit will be more fruitful. Camera shake was not a problem on shorter exposures – up to two seconds, for example. 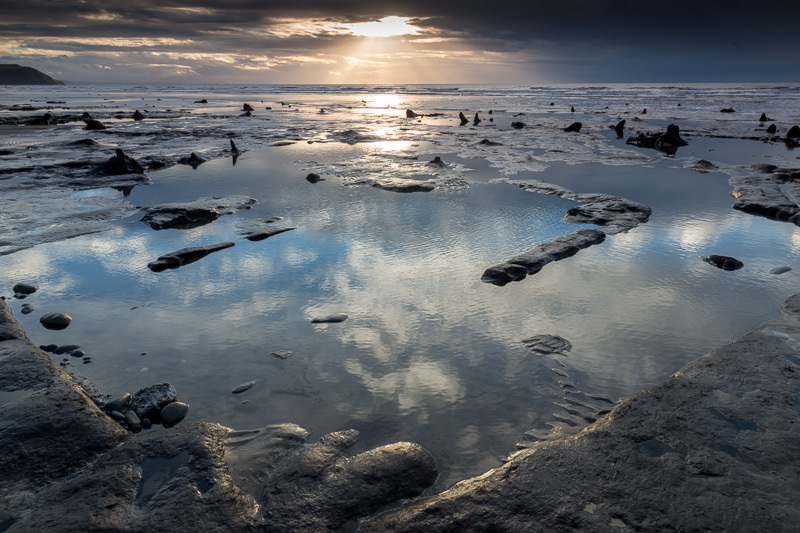 My third visit – yesterday – was on a cracking sunny afternoon with little wind to ruffle the pools of water gathered in depressions in the peat, and a pleasant sunset. It took me some time to get to grips with some rather chaotic subject matter, and I don’t think I’m there yet. In some ways I found little arrangements of rounded rocks more photogenic than the tree stumps. One thing I could do nothing about was the fact that at low tide the waves were breaking beyond the forest, lower down the beach. I would need to be there on a falling or rising tide to get the pictures I have in my mind’s eye. Oh, and the sun would be setting. It should be easy! So it is work in progress at the moment, but there seems to be little likelihood of the submerged forest disappearing in the near future. I’ll be down at the beach again tomorrow afternoon if the sun is shining, and while I’m there I’ll know that I’m walking through history. This entry was posted in Uncategorized and tagged aberystwyth storms, camera shake, sea level rise, submerged forest. Bookmark the permalink. Atmospheric stuff Jerry, even if it didn’t satisfy your own projections! Good old Borth ….. must be 34 years since we first met there? Never seen the peat cuttings before ……… and when did people start using saws? Job for Google. If you have the time it’s worth returning over and over again to this kind of location if you have a particular image in mind, especially if it is a technically tricky one. Years ago, in the days of film, I did manage a “flowing water” image there that I was pleased with. No need for the heavy filtration….it was nearly dark. But the ability now to process images to one’s satisfaction means the chances of getting a good result are, in theory, that much greater.